Question 3. How much should be done and spent on shoring up our shores? This depends on how fast and how much sea level will rise this century and beyond. We should look to the Netherlands to mirror what they have done against the sea, but realize that great swaths of land will eventually go underwater no matter what we do. This is particularly true in south Florida and southern Louisiana. So, for long term plans money should not be wasted to save beach front property for just a couple of decades. Plans should be made to relocate population centers away from the coast. American water infrastructure hasn’t kept pace with flood risk, and a leaked draft of the administration’s proposals includes stormwater, flooding and water control infrastructure. “Some of our [water] infrastructure, frankly, is an international joke,” said Ed Thomas, president of the National Hazard Mitigation Association. “Our levees, such as they are, meet no known standard of engineering excellence in the civilized world,” he said. There are about 30,000 miles of levees in the United States, and only about 12,000 are in good shape. Often, farmers would throw up dirt mounds to protect their fields — and as the years passed, those farms became subdivisions without any fortifications to the levees. Question 4. Do dollars get spent on energy infrastructure? The American Petroleum Institute has pitched pipelines as infrastructure projects that need zero public investment. And lawmakers from energy-rich states have been eager to open more markets for their states’ commodities. After the State of the Union, Sen. John Barrasso (R-Wyo.) mentioned that energy infrastructure could have a role in the president’s plan. And earlier this month, Sen. Shelley Moore Capito (R-W.Va.) said New England’s need to import liquefied natural gas from Russia suggests the need for more pipelines, despite local objections (Climatewire Jan. 24). Any money spent should not support fossil fuel infrastructure period. That includes pipelines, refineries and ports. What we need to build are high capacity electrical storage facilities to hold all the juice from solar and wind farms. Also, we need to build efficient power lines extending from any green facilities to homes and businesses taking coal powered plants offline in the process. Question 5. What about airports? 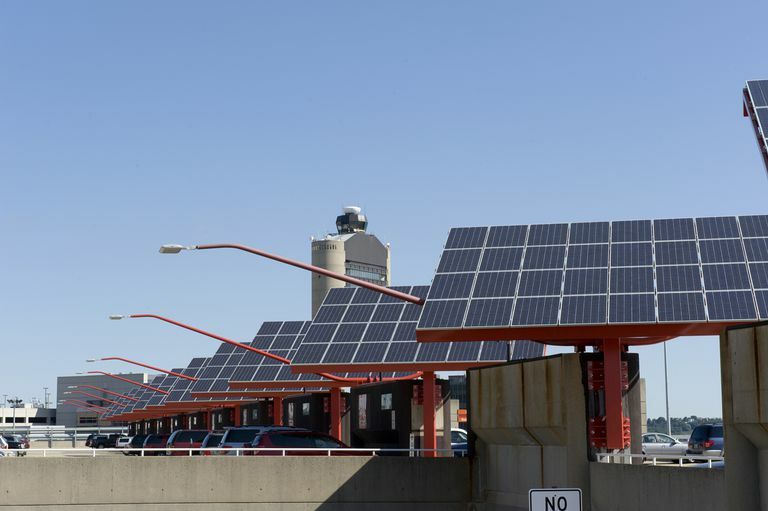 Boston Logan proved to be one of the leaders in green initiatives with the first LEED certified airport terminal in the U.S. In addition, the airport has wind turbines and solar panels. More recently, the gates at BOS were outfitted with aircraft plug-in power options at each gate so that airplanes don’t have to run the auxiliary power units as much while located at the gate. Also, Boston has paved runways with an environmentally-friendly asphalt mix, which according to the article, has cut CO2 emissions dramatically. If you, the reader, can think of more infrastructure questions just drop me a note. The streak of warmth in California is ridiculous. 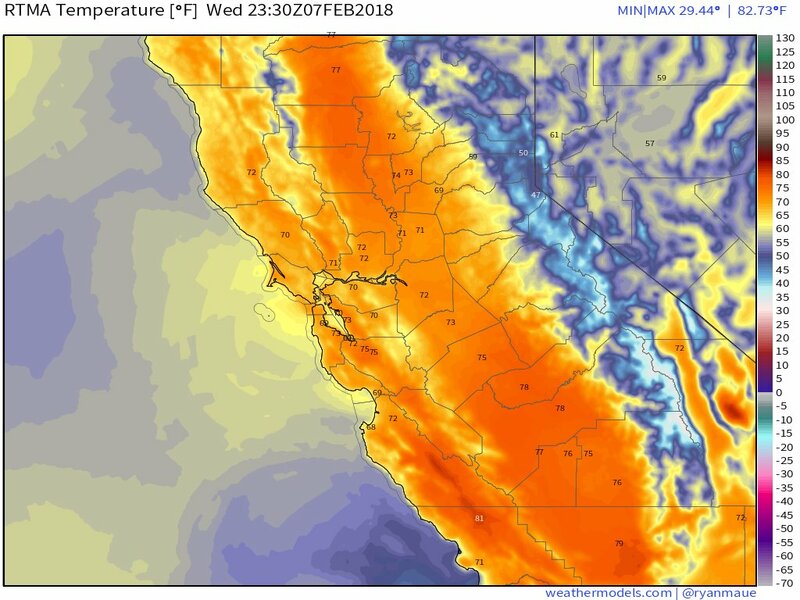 San Francisco in the 70s every day so far this month with record highs on the 2nd, 3rd, 4th, 5th, 6th.